How to automate and what are the automation testing tools? "How to automate and what are the automation testing tools?" Automation testing mainly supplements manual testing and makes the whole testing process more efficient. 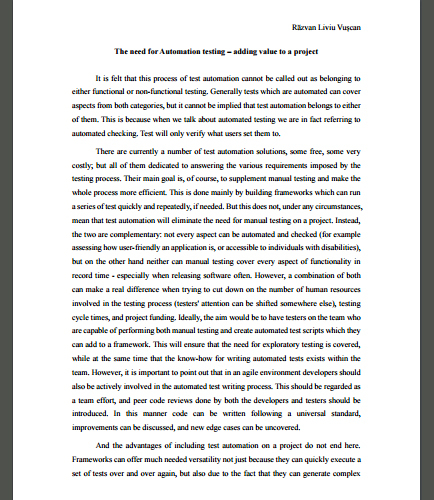 This whitepaper discusses about the advantages of including automation testing on a project, and how it provides a clear idea to testers, developers and clients about the functionality of product in order to overcome failures. Is the team already experienced with using test automation? Do they have an automation framework in place that can easily be fitted to a new project? How much time does it take to build such a framework? Are the tools used for automation free or do they require bought licenses? An automation framework is nothing but an integrated, rigorously structured system, capable of establishing a set of rules for the test automation of a software product. Why is it necessary to include Test Automation Framework? Test automation framework contains libraries, methods, test modules, resource and configuration files, and documentation needed to run on specific product and can easily enhance the functionality by selecting or removing the components to fit the current project realities. What are the three types of Automation framework models and how do they differ?